Hello Hello! I am sooooo happy that this week is over – it was a particularly tough one for me. And I am beyond happy that today, Friday, is the Summer Solstice! The Solstices are my two very favorite holidays, and the Summer Solstice, well, it’s the longest day of the year! The very most light! As a sun-worshiper to my core (if I prayed to a deity, it would be Sol), it’s the day that gives me the most of what I love. Want to celebrate Solstice tonight? Stay outside late, give thanks for lightness and brightness and photons, ponder the duality of nature (the days will be getting shorter again, tomorrow), and most of all – have bunches of fun! Plant a flower, climb a tree, or just salute and blow a kiss at the sun. Happy Solstice! There are some really amazing things going on in my life right now. I am grateful for those. But still, these are hard times. I don’t really show you guys much of that, but they are. Still trying to land on my feet, I suppose. And right now I continue to struggle with the same sorts of larger, abstract ideas that I’ve been wrestling with for a while. What it means to be a creative person. What it means to forge your own path. What am I willing to sacrifice, and when is it time to throw in the towel? These themes reveal themselves in my musical choices. Amanda Palmer. Macklemore. And this week, this song by Aesop Rock has been on replay. And now for the fun part, the fabulous part, Le Love List! napping in the grass that runs along the beach, on a perfectly warm and breezy day .|. god I love living near the beach! .|. nachos. nachos are better at midnight. it’s been confirmed. .|. RuPaul and girl talk with a girlfriend who’s leaving me soon . . . for Portland! Oi. .|. big bowls of steamed broccoli .|. waking up, rolling over, and seeing Waits’s smiling face. “Mama, let’s get up and PLAY!” .|. powering through food poisoning, I am a freakin’ warrior .|. This video Waits and I made just messing around being silly. Oh my goodness kid. You make this vegan mama so proud! pattern recognition .|. the kind of friends who let you show up, unannounced, in the still-having-morning-coffee hour, and cry all over their front porch .|. sharing music .|. my friends out there in the ether-web .|. hacking my old favorite Veggie Grill salad to make it gluten-free, oh how I’ve missed you buffalo sauce of glee!!! .|. pistachios or almonds? that was a fun conversation. (and still to be determined!) .|. SEEING GRETCHEN!!! .|. warm weather and late nights hanging on the front porch .|. when things are really bad but you have the right people who keep you centered, lift you up, light your fire and set you off again. that’s everything, I guess . . .
Alright guys, now it’s your turn – let me know what you’re loving this week! This happy little post will stay at the top of the page all weekend, so stop by any time to leave your Love List, ask a question, or offer some feedback! Or if you’re new, feel free to just introduce yourself and say ‘Oi!’! This is your community, so get involved! No frogs! What a sweet kid, reminds me a whole bunch of my 9 year old when he was that age. Only now J has hair halfway down his back. Also, it’s odd to think of others having summer solstice. We are in our shortest day down here and after a crazy week weather-wise I’m glad to be on the flip side. It’s Winter Solstice on my side of the globe, so I’m all cosied up with a hot water bottle and a big old bowl of roast veggies (and a glass of mulled wine!) Happy days. -My theatre company does Shakespeare in the Park every June and August ;) Spending the longest night of the year outside working on a play! YES!!! -Buying a flat of strawberries tomorrow and making Strawberry Jam! NOMS! -Hopefully my parent’s pool will be warm enough to swim in tomorrow!!! YAY!!! I am not a summer lover myself, but last night I spotted my first fireflies of the season and they filled me with such joy that I squealed and then smiled all the bike ride home. Riding home at 9:15 PM in the fading light is nice, too. And honestly, I don’t think I would be the only one open to hearing about the hardships you are facing. We are here for you to vent. Thoughts that are not happy have there place. You never know, it may help someone else know they are not alone. I love summer! with my babies (3yr old and new twin girls!). Thanks for the inspiration Sayward! 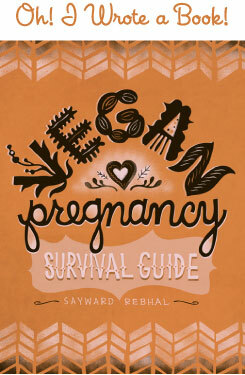 Raising vegan babies is so much cooler with your blog. Yay for you – you’re keeping your head up and your thoughts positive. In your place, lots of people fold up but you’re working hard to stay open and vibrant. Keep up the fight, girl. ~ I love that it’s Friday weeeee! •28 more days of work. 38 more days of Alaska. •My dog Keira, for always forgiving me and smiling at me even though I take her for granted a lot lately. •Green smoothies brought to me at work by the only vegan I have met in Alaska, I adore her. •Piecing together my blogging ideas. •Solstice, which also happens to be my anniversary. On to a great weekend!! sending you positive energy, Sayward. It is evidence of deep emotion that we sometimes feel overwhelmed; it is from that same well that we can find our bliss. I am thankful to come through the other side of a rough week as well. Rad video thanks for sharing! 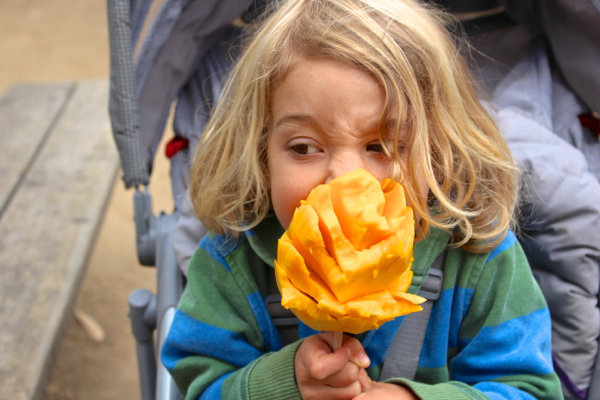 The mango on a stick looked so amazing my daughter started jumping up and down asking me to make it! Mission accomplished, except the mango kept sliding down our (chop)stick. Will work to improve method. Thanks for sharing!! -Indian food- boyfriend hugs- hikes on the San Francisco peaks- watching the sunset with beer in hand- making new connections- spending my 3-year anniversary with Chris (first time we’ve spent an anniversary together) (and it was on the solstice! )- watching Mexican folk dancing in Heritage Square- afternoon naps- cooking- my family! Have a better week, Sayward!